In the 1999 New York Mets Wild Card season, Franco started out the month of April with eight saves and an ERA of 0.96. He continued to pitch well converting his first 14 straight save opportunities, going into early June. He would earn 19 saves with an 0-2 record & only one blown save by July 2nd. He then missed two months of action due to a thumb injury. Manager Bobby Valentine gave the closers role to Armando Benitez as the Mets went into the pennant & wild card race. When Franco returned he found himself in a new role, as the teams set up man. He went out accepted his new role & did his job helping the Mets tie for the wild card title at the end of the season. The Mets went on to beat Franco's old team the Cincinnati Reds in a one game playoff to advance to their first post season in eleven years. He finished the year at 0-2 with 19 saves & a 2.88 ERA in 46 appearances, Armando Benitez saved 22 games. Franco struck out 41 batters 40.2 innings of work while walking 19. 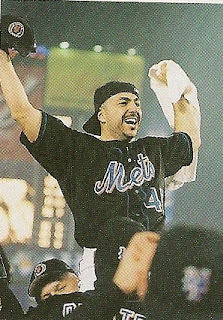 Post Season: In the 1999 NLDS against the Arizona Diamondbacks Franco made his first appearance finishing out the Mets 7-1 loss at Arizona. He made another appearance pitching a scoreless 8th inning in Game #3, in the Mets 9-2 win at Shea Stadium. He then got the win in the final Game #4, as he pitched a perfect 10th inning before Todd Pratt hit the famous walk off series winning HR. Franco appeared in three games of the NLCS against the Atlanta Braves giving up one run in 2.2 innings pitched, with three strike outs. In the classic 15 inning Game #5 at Shea Stadium, he pitched a scoreless 8th & 9th innings, leading up to Robin Ventura's walk off grand slam single. 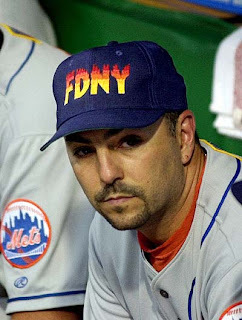 In the 2000 Mets NL Pennant season, Franco turned 40 years old & was now in the set up man role. On April 14th he pitched two innings at Pittsburgh earning his first win of the year when Melvin Mora singled in the 8th, to break a tie game & Mike Piazza blasted a two run HR. In May he earned save in Florida & then another at Shea Stadium on May 17th against the Colorado Rockies. At Dodger Stadium he earned a win on May 30th pitching just 0.1 innings as the Mets scored six runs in the top of the 9th inning. In June he took a loss at Wrigley Field after allowing two singles & then an infield error forced the unearned winning run to score. He took one other loss that month but then would not have another losing decision for two & a half months. That loss came on September 6th, being his final decision on the year. Franco went 5-4 with three saves and twenty holds credited to his record as he appeared in 62 games, the most in his Mets career. He posted a 3.40 ERA striking out 56 batters in 55 innings making him one of the leagues best set up men. Post Season: In the 2000 NLDS against the Giants, he came into the 10th inning of Game #2 in San Francisco, after Armando Benitez had given up a leadoff single. Jay Payton had singled home the Mets go ahead run in the top of the inning. Franco retired the side in order including getting slugger Barry Bonds to go down looking at a third strike. The Mets won the game & evened the series at one game apiece. He made one more appearance in the extra inning Mets win in game #3 at Shea Stadium. In the NLCS against the St. Louis Cardinals he made his first appearance in the 8th inning of game #1, in relief of Mike Hampton. Franco got credit for a hold as the Mets won 6-2. In Game #2 he gave up two runs in 2/3 of an inning at Shea Stadium. After putting two runners on he allowed a wild pitch & then an RBI double to JD Drew. He made one more appearance pitching a scoreless 8th inning, in the Mets 10-6 Game #4 win at Shea. Overall Franco appeared in three NLCS games allowing two runs on three hits while striking out three in 2.2 innings pitched. 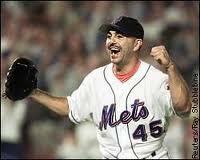 In the 2000 Subway World Series he made his first World Series appearance in Game #1 pitching a scoreless 8th inning. In Game #3 at Shea Stadium, he pitched a scoreless top of the 8th inning leaving the mound with in a 2-2 tie. In the bottom of the inning Benny Agbayani doubled to score Todd Zeile breaking the tie, putting the Mets ahead. Next Bubba Trammell added an RBI sac fly for a Mets insurance run. The Mets went on to a 4-2 win as Franco earned his only World Series victory. Overall Franco appeared in four Series games, allowing no runs on three hits in 3.1 innings of work, getting the win in the only Mets victory. He finished his post season career at 2-0 with a 1.88 ERA appearing in 15 games striking out 10 batters with three walks in 14 innings pitched. In 2001 Franco recorded a 4.05 ERA going 6-2 and with two saves. He pitched 53 innings in 58 appearances striking out 50 batters although he walked 19 & gave up 55 hits. 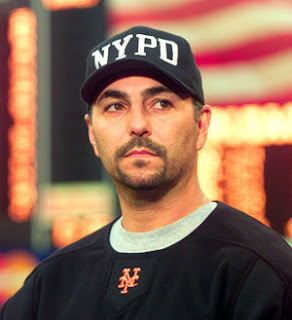 After the 911 tragedies he helped in the relief efforts at Shea Stadium with loading trucks with supplies and reaching out into the community. The events really hit home for the New Yorker, besides his own ties to the city, his father was a NY Sanitation worker & his uncle was a Firefighter. 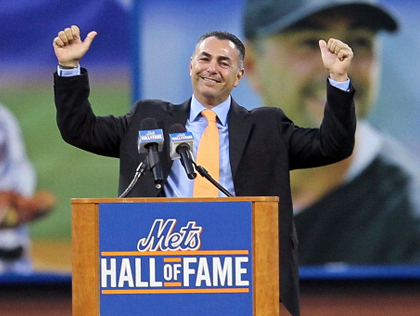 The native New Yorker became a highly public Mets figure once again. In the first game played after the September 11th tragedies, Franco was the winning pitcher at PNC Park in Pittsburgh. In the top of the 9th inning Rey Ordonez singled in a run & Mark Johnson drove in two more with a double. In the famous first game played after the 911 tragedy, Franco pitched a perfect 8th inning at Pittsburgh earning the New York victory. In the first game played back in New York after 911, Franco came in the 8th inning against the Atlanta Braves. He got the first two outs but then surrendered a walk to Julio Franco & a hit to Chipper Jones. Bobby Valentine yanked, Franco & gave the ball to Armando Benitez who allowed a double to Brian Jordan, breaking the tie. Mike Piazza blasted his famous game winning HR in the bottom of the inning, giving New York the exciting win. The next season it seemed Franco’s career was over when he had to get Tommy John surgery & missed the entire season. 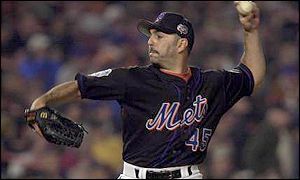 But on May 30th 2003 at age 42, he returned to the mound at Shea Stadium pitching one inning against the Atlanta Braves. On July 21st he earned a save at Philadelphia against the Phillies. He made 38 appearances on the year, posting a 2.62 ERA while going 0-3 with a 2.62 ERA. In 2004 he hung on as long as he could to pitch his final season with Mets. 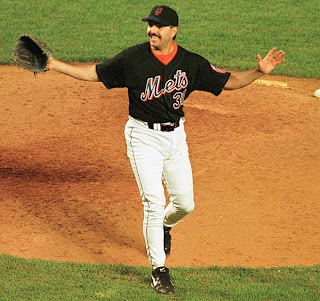 He earned his final Met win in the July 3rd subway series game, when Shane Spencer drove in the winning run on a fielder’s choice scoring Kaz Matsui. From there he dropped his last three decisions & only appeared in seven games over the final two months of the season. He pitched the 8th inning on the final day of the season. He went 2-7 with 11 holds on the year, posting a 5.28 ERA in 56 appearances. His 15 year Mets career ended on November 1st when he was granted free agency. In his Mets career he is the clubs all time saves leader with 276 career saves. 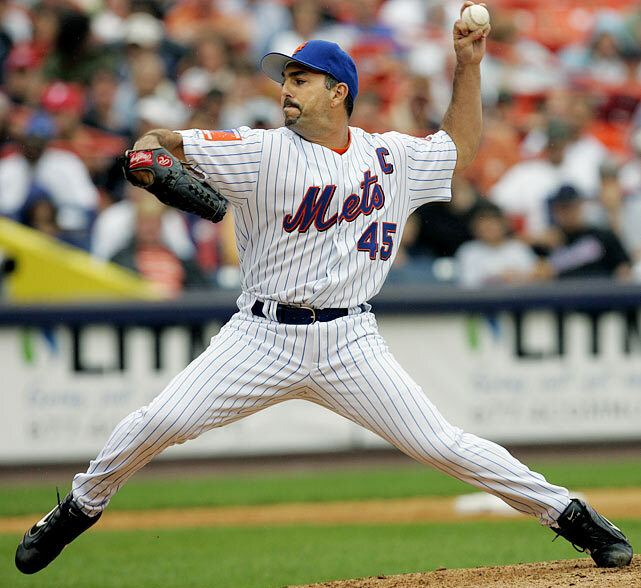 He is also first in Mets appearances with 695 games pitched & 15th on the Mets all time list with 48 wins. Franco is 14th on the Mets list with a career 3.10 ERA. He has pitched 702 innings, posting a 48-56 record, with 592 strikeouts. He posted ERAs under two twice with the Mets (1992 & 1996) & ERAs under three, nine different times. He signed with the Houston Astros in 2005 and retired that July after appearing in 31 games. John Franco is the all time left handed save leader (424) & fourth all time over all in saves. His is first among National League pitchers all time in appearances with 1119 games pitched, the third highest total ever in the majors behind former Mets Jesse Orosco & Mike Stanton. In his 21 year career Franco went 90-87 with 975 strikeouts & 495 walks in 1245 innings pitched finishing off 774 games (4th all time) posting an overall 2.89 ERA. Retirement: John was on hand for Bob Murphy Night, Ralph Kiner Night & Mike Piazza Night at Shea Stadium. He attended the closing ceremonies of Shea Stadium in 2008 as well. 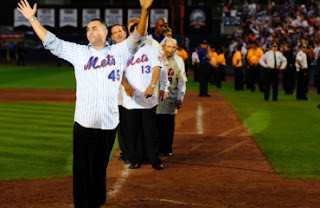 He had the honor of throwing out the first pitch at the first game ever played at the new Citi Field in March 2009. It was a college game between his old St. Johns school & Georgetown University. 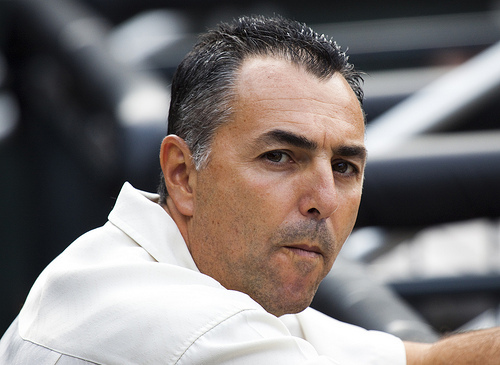 Franco is a member of the Italian American Hall of Fame. On June 12th 2012 he was inducted into the New York Mets Hall of Fame at Citi Field. In attendance was his family, friends & many old pals from his St. John's days. Former Mets players included Al Leiter who did the introduction, Frank Viola, Daryl Strawberry & Dwight Gooden. Franco is the Mets all time save leader (276) & leader in games pitched (695). Family: Franco has been married to his high school sweetheart Rose for many years. Their son J.J. is an infielder at Brown University & was drafted by the New York Mets out of high school.